For the majority of Matty P’s Radio Happy Hour listeners, The San Diego Comic-Con is a completely new experience. Over the past four decades, this event has grown from a strictly comic book convention of about 300 people to the largest pop culture convention in the world with an average attendance of over 125,000 per day of the convention. The Mayors Citizen Task Force estimates that the SDCC alone will boost $75 million in direct spending and $2.6 million in tax revenues for the area. It completely takes over the city of San Diego and its downtown (known as The Gaslamp District) for the week and it grips me and those of my kind with a genuine passion. The SDCC is a four-day convention with a mix of panels, seminars, comic book stores, collector’s shops, artist alleys, cosplay, and workshops for artists and film professionals. There are previews of the biggest feature films, portfolio reviews, exclusive collectibles and toys and collections of top comic book artists and an explosion of video game designers. The representative themes include a major presence of Star Wars, Marvel and DC Super Heroes, Horror, Simpsons, Manga, and unfortunately Twilight. All of the major television and movie studios and book publishers participate with exhibits, panels, exclusives and SWAG. So much SWAG. Like oceans of sweet sweet SWAG. Comic-Con also brings out the biggest Hollywood stars and directors. In my years alone I have seen such A-listers as Angelina Jolie, Harrison Ford, Joss Whedon, Robert Downey Jr., Mark Hamill, and the legend himself, Stan Lee. If you were born anytime after 1970, then there is a good chance that there is a comic, cartoon, movie, toy or video game that will interest you. In addition, the SDCC is also a four-day long party where freaks, geeks, and a surprising amount of beautiful people all come out to play. If you hang out at the Bayside Hilton like I did, then you too could have had a drink with McLoven and Baba Booey or maybe that guy with the funny hat on Myth Busters or even one of the many adult film stars that model and “inspire” the artists. Comic-Con has something for everybody and, yes, even Robert Pattinson. The Matty P’s Radio Happy Hour’s San Diego Comic-Con Coverage will include coverage of the exhibits, the people and the panels that make the SDCC the greatest pop-culture event in the world. We will wrap up our coverage with a little help from our friends at “Open Your Toys” for toy reviews. It’s no surprise that Matty P listeners are typically the “Cool Kids” at the lunch table so I’ll try to introduce the look of the Comic-Con Exhibit Hall and the exhibits that is houses. One of the advantages of being a poorly paid member of the press is that you actually get into the Exhibit Hall before it opens for the regular attendees. Some of the pictures that you see here are all before the rush of 125,000 people. 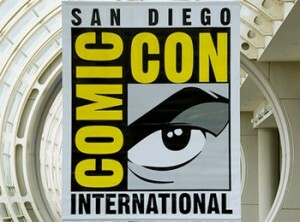 In addition to the four days of the convention, Comic-Con also offers select attendees a “Preview Night”. Preview Night is always held on that Wednesday of Comic-Con week. This is the day when most of the attendees pick up their badges and the Preview Night allows all attendees to see the Exhibit Hall before the official open of the convention the next day. It’s totally eye candy for the geek in all of us. To get grasp on the scale of Comic-Con, take a look at the two pictures above for a quick behind the scenes look at the convention floor before and after the open. The one thing that you’ll notice in the “before” pictures is open space. The SDCC is held at the San Diego Convention Center plus some extracurricular events in surrounding hotels including the Hilton Bayside, The Omni, and The Marriott. The San Diego Convention Center alone has the capacity for 130,000 people. On July 11, 2012 at 5:15 you can see the floor. By 6:15 on that same day, just 15 minutes after the doors open for Preview Night, you’ll see close to 130,000 people all happily wandering around and enjoying the exhibits. And you won’t see the floor again for days. Take a step outside the Convention Center and you’ll notice billboards, trucks, and downtown restaurants decorated in the themes of your favorite shows or movies. At the very least, you’re bound to see a few Star Wars Storm Troopers in line at the Starbucks. For some, Comic-Con is all about the exhibits. I collected a few on-site and behind the scenes photos of the Exhibit Hall. Some of these photos are of the assembling of the exhibits before the opening to the general public. Some of the photos that you’ll see were taken outside of the Convention Center but still a part of the celebration, including the photos of all the Batmobiles of TV and film. These photos were taken in front of the Bayside Hilton at one of the coolest exhibits this reporter has ever scene. Here you see the building of Hasbro’s Marvel Superhero diorama. One of the most popular exhibits is of Sideshow Collectibles www.sideshowtoy.com. Makers of premier collectibles. Iron Man 12in Scale Figure by Hot Toys! The Joker 12″ Figure by Hot Toys! To promote the new book Batmobile:The Complete History all the Batmobiles were on location at this years Comic-Con. If you had on a Batman shirt you got to sit inside one of them and get your picture taken. These rules were strictly enforced! I saw two young brothers. One with a Batman shirt and the other with a Superman shirt. Superman cried because he couldn’t get in the car. And now in chronological order… The Batmobiles. If people-watching is your thing, the SDCC has a lot to offer. I’ve collected a few of my favorite images of the interesting people that I captured in and around the Convention Center. There are always a ton of celebrities that are involved in the panels to promote their films, shows, and other projects, but these pictures were all taken while just walking around. Every year it amazes me as to the accessibility of these celebrities. And every year it amazes me at the creativity of the costumes that are created and the attractiveness of some of the women who wear them. Take a look at the pictures from the San Diego Comic-Con 2012 and remember to catch some of Comic-Con’s favorite celebrities live on the Matty P’s Radio Happy Hour when we go back on the air live August 16th. I don’t know who this is but it’s the best costume I’ve ever seen! Yes, Mark Hamill “Luke Skywalker” from the Star Wars films at the Hasbro Booth. Looks like Harley Quinn and Wonder Women but seriously, who cares?…Enjoy! The exhibits and the people-watching are great passive elements of SDCC, but the real meat and potatoes are in the panels and merchandise. From valuable collectibles made exclusively for the Con to major summer blockbuster reveals to a bunch of Battlestar Galactica temporary tattoos, you will have literally hundreds of chances to stand in line again. Hell, you’ll have to choose which lines you can and can’t stand in. And these lines are the real thing, the kind that don’t ever move and eventually show up on Google Earth. But don’t get me wrong, these are actually worth standing in if you have even an ounce of geek in your blood. The rewards are great, and there is no better setting for a long wait. It’s not the DMV, it’s a love-in. I still stay in touch with people I shared lines with years ago, and I already have several new line buddies in my phone this year. You learn by your first or second Con that strategy is key. There are four days of panels, but there are literally hundreds of them packed into that time frame, and hard choices have to be made. For instance, you might have to leave the big Warner Bros panel before seeing the world premiere of the new Superman (Man of Steel) movie trailer in order to catch the Oddball Comics panel, or skip the Halo 4 panel altogether in order to line up for a potentially valuable exclusive toy from Mattel. Choices, choices. In the end, you actually regret that you couldn’t wait in more lines. Seriously, it affects your brain that way. Cast and Crew From left clockwise Adam Baldwin, Alan Tudyk, Tim Minear, Sean Maher, Nathan Fillion, Joss Whedon, Summer Glau. Big News!! !Joss Whedon is thinking about a Serenity sequel that will include a flashback between Walsh and Book. Hall H holds 6,500 seats so even when you don’t have a good one you’ll always have a nice big screen in front of you to watch. Zombies were everywhere at Comic-Con this year, thanks especially to AMC’s hit show The Walking Dead. Matty P Listeners may remember recent interviews with series regulars Steven Yuen and friend of the show, Michael Rooker. My last look back at Comic-Con 2012. It’s hard to imagine already missing something that makes you so tired and broke. See you next year, geeks.